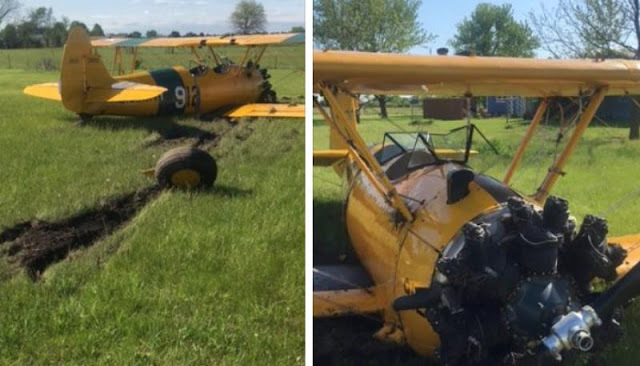 On April 28, 2016, about 1510 central daylight time, a Boeing A75N1 (PT-17) single-engine airplane, N17PY, was substantially damaged after it impacted terrain during initial climb near Osage City Municipal Airport (53K), Osage City, Kansas. The pilot and two passengers reported no injuries. The airplane was registered to, and operated by a private individual, as a 14 Code of Federal Regulations Part 91 sport parachuting flight. Visual meteorological conditions (VMC) prevailed and a flight plan had not been filed. At the time of the accident the airplane was departing 53K for a local flight. The airplane had made a takeoff to the north with the pilot seated in the rear cockpit and with two parachutists standing outside on the lower wing while they were holding on to the edge of the front cockpit. After the airplane had climbed to about 200 feet above ground level the pilot reported that he sensed a loss of engine power and the airplane stopped climbing. The airplane began descending and the pilot executed an off-airport forced landing to a flat open field in a residential area about 1,600 feet north of 53K. The airplane cleared the top of 32-foot tall electric power lines and came to rest upright about 100 feet from the initial touchdown spot. The impact with the muddy field resulted in the complete separation of both main landing gear legs and substantial damage to the lower wing and the fuselage. The two parachutists reported that they were not ejected, and they had remained restrained by a safety strap. A postaccident examination of the airplane at the scene showed there was adequate fuel on board. There was no fuel spill and no postimpact fire. Flight control continuity was confirmed. The pilot said he did not use carburetor heat. An examination of the engine and its components showed no anomalies. An examination and testing of the engine spark plugs indicated normal wear and that they were fully functional. The wiring harness was visually inspected and appeared normal. A bench test of both magnetos showed they were fully functional. The closest official weather reporting station was at KFOE, Topeka, Kansas; located 20 miles northeast from the accident location, At 1453 the automated surface observation system at KFOE reported wind from 330 degrees at 13 knots, visibility 10 miles, scattered clouds at 2,700 feet above ground level, temperature 16 degrees Celsius (C), dew point 8 degrees C, and an altimeter setting of 29.96 inches of Mercury. A review of the carburetor icing probability chart in Federal Aviation Administration, Special Information Bulletin CE-09-35, revealed the airplane was operating in an area favorable for serious icing at glide and cruise power settings.